Marketers may be underestimating the importance of the mobile Web according to new research from the Interactive Advertising Bureau (IAB) and its Mobile Marketing Center of Excellence. Although comScore research recently indicated that smartphone users spend more than 88 percent of their mobile time in the app environment, the IAB’s “Apps and Mobile Web: Understanding the Two Sides of the Mobile Coin” research report reveals that much of this “app time” may actually be mobile Web use in disguise. Due to this, the study suggests that brands should account for the fact that many consumers may be arriving and viewing mobile websites through a variety of pathways, including apps. In fact, the study found that only 18 percent of smartphone owners who use the mobile Internet on their devices say they spend significantly more time using mobile apps than browsing mobile websites. That said, 52 percent of smartphone owners say they click links within apps that take them to content on mobile websites at least sometimes or more frequently. 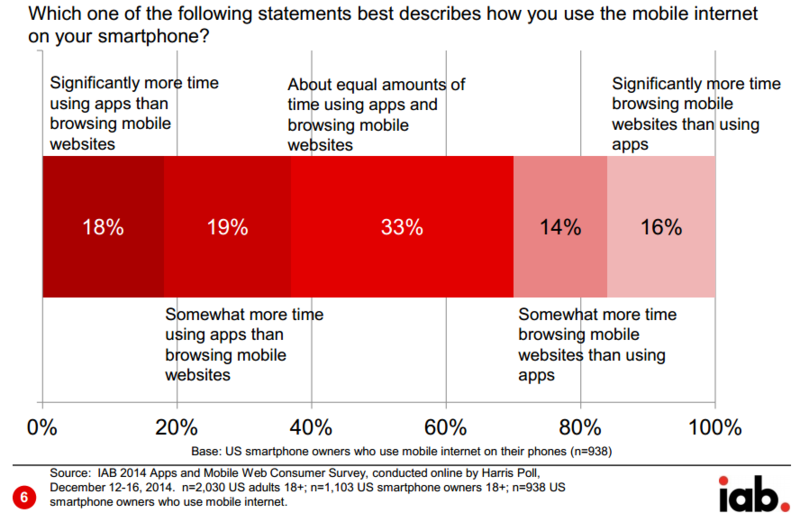 This means that while these users are technically using a mobile app, they are also spending time on the mobile Web. It is also important to note that when respondents were asked what they preferred (mobile apps or the mobile Web) for several activities, respondents tended to skew toward the mobile Web or were balanced between the two approaches. For instance, when it comes to search, 42 percent of respondents prefer the mobile Web, 32 percent have no preference and just 29 percent prefer apps. Conversely, 28 percent of respondents prefer the mobile Web when it comes to shopping, while 26 percent have no preference and 22 percent prefer apps. Moreover, 25 percent of respondents prefer the mobile Web when it comes to news and local directories, while 31 percent have no preference. Additional research shows that there are a variety of ways that smartphone users find sites to visit on the mobile Web. According to the data, 54 percent of respondents say search is a primary tool, while 29 percent say they discover websites through recommendations (via email, word-of-mouth, etc.) and 26 percent cite links in social media apps.